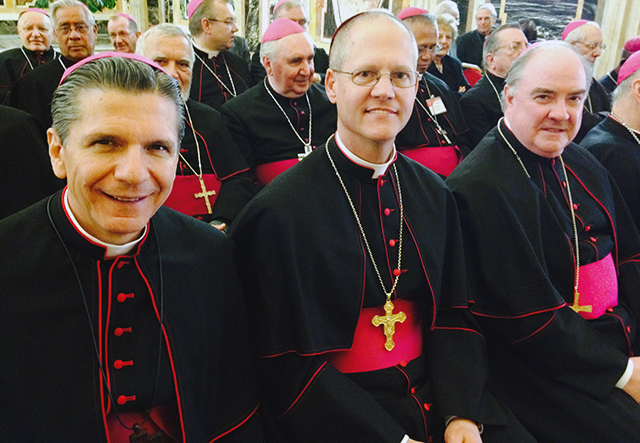 Three American bishops at audience with Pope Francis on Feb. 27 were Archbishop Gustavo Garcia-Siller of San Antonio, Bishop Paul D. Etienne of Cheyenne, Wyoming and yours truly. On Feb. 27 a group of bishops and friends of the Focolare Movement met in the Vatican Apostolic Palace with Pope Francis. I found Pope Francis to be a wonderfully simple man of God. 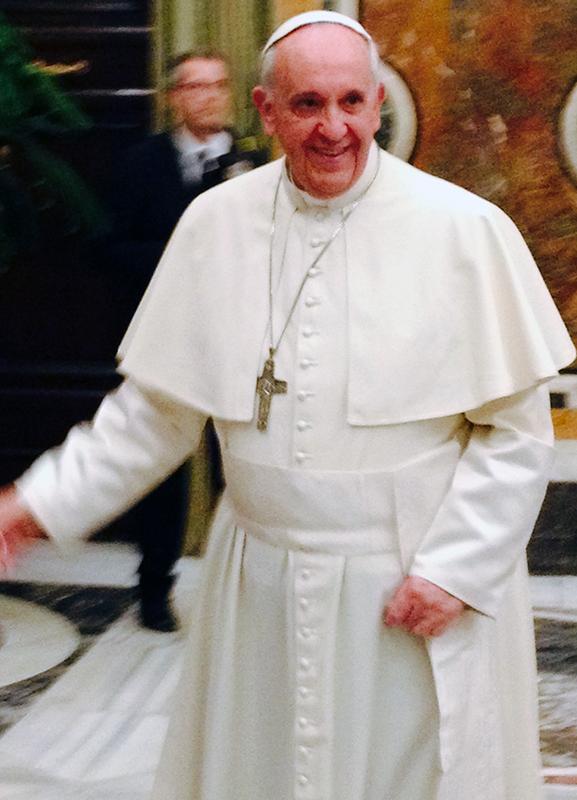 Pope Francis during audience with bishops and friends of the Focolare Movement. This yearning is for all his sons to live as brothers – ‘that all of them may be one’. It also reveals the vitality of the Holy Spirit. “Cultivating the spirituality of communion also contributes to making us more able to walk the path of ecumenism and inter-religious dialogue,” Pope Francis said. The pope asked us to ensure that we place all we receive “to the benefit of the entire Church.” He said that society “has a great need for the testimony of a style of life, from which their transpires the novelty offered to us by Lord Jesus,” which is to care for each other. In the coming months I hope to share with all of you the extraordinary and simple call of the Holy Father to be missionary disciples in the New Evangelization. May Mary, Our Blessed Mother, inspire us to live more radically the word of God. On the Feast of the Presentation of the Lord, I celebrated Mass at the Cathedral in recognition of World Day of Consecrated Life. 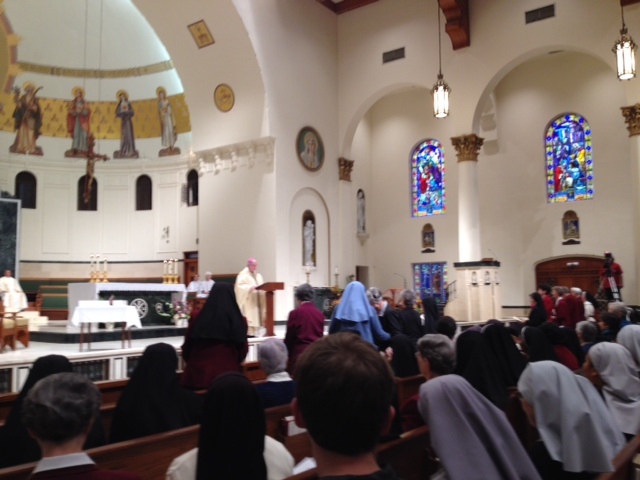 We were blessed to have more than 100 religious sisters and brothers in attendance. We especially acknowledged the service of 15 sisters who were observing from 25 to 75 years of dedicated service to God’s people. Those celebrating their jubilees included Pax Christi Sisters Guadalupe Cervantes and Patricia Zuniga, 25 years; Sister Elsa Joseph, SABS and Sister Amor Vigare, OP, 40 years; Sister Elizabeth Close, IWBS, Sister Celia Hernandez, MJMJ and Sister Lydia Plastas, SFCC, 50 years; Incarnate Word Sisters Mary Lelia Aguilar, Mary Camelia Herlihy, Mary Colette Brehony and Martha Ann Snapka, 60 years; Sister Barbara Bluntzer, SP, Sister Mary Catherine Brehony, IWBS and Sister Kathleen McDonagh, ISBS, 65 years; and Sister Mary Anselm Till, IWBS, 75 years. The jubilarians committed themselves to the Lord thorough professing the evangelical counsels of celibate, chastity, poverty, and obedience. On behalf of the church I thanked them for their years of dedicated service. 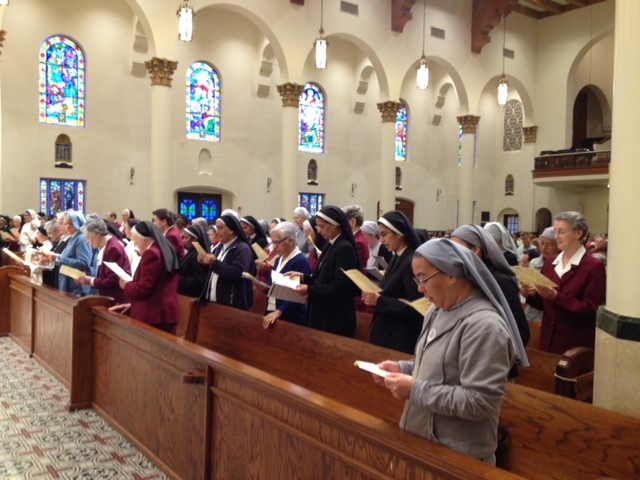 At my invitation they renewed their commitment to follow Christ in consecrated life. Let us pray to our Loving God, who invited these women and men to a life of public service in and to our church, that they may continue to bear witness to the great grace of their vocation, persevering in a life of prayer and service. Please extend your appreciation to the women and men religious that are present in your lives of faith. 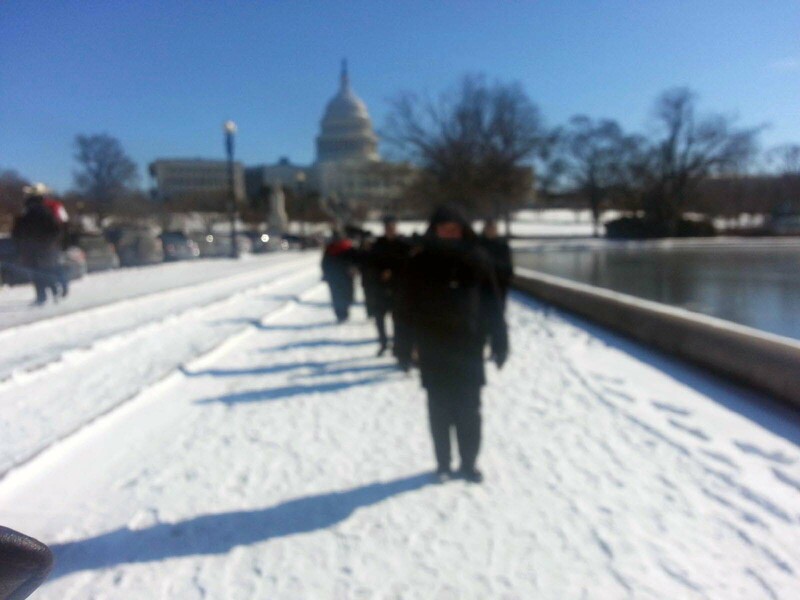 This week a delegation from the Diocese of Corpus Christi joined tens of thousands of Pro Life advocates in frigid, freezing weather with temperatures almost below zero. This year marks the 41st anniversary of the Supreme Court’s decision in Roe v. Wade, which legalized abortion in the United States. It was impressive to see so many young people at the March for Life. The young are truly to pro-life generation. Since that dreadful decision, an estimated 55 million of our brothers and sisters have been aborted. While we abhor the decision and its after effects, we must pray for those who participate in abortions. I ask everyone to join us in prayers in defense of human life and the overturn of Roe v. Wade. May god bless all life. On Saturday, January 11, nearly 1,000 catechists and parishioners turned out for our 25th annual ministry conference held at the American Bank Center in Corpus Christi. The conference offered a number of workshops to help those in ministry in carrying out their work in the New Evangelization. Below is a podcast of the homily I gave at the Cathedral on the closing of the Year of Faith on Nov. 24. We closed the Year of Faith—called by Pope Emeritus Benedict XVI to mark the 50th anniversary of the opening of the Second Vatican Council and the 20th anniversary of the publication of the Catechism of the Catholic Church—on the solemnity of Our Lord Jesus Christ, King of the Universe. On Thursday, Oct 17, I celebrated the annual White Mass at the CHRISTUS Spohn Hospital – Shoreline Chapel. The White Mass honors healthcare professionals and is celebrated in conjunction with the Feast of St. Luke, patron of physicians and surgeons. Following is my homily from this Mass, which touches on the need for health professionals to rely on faith in Jesus Christ as they perform their ministry—a ministry deep in mystery. Jesus is the great healer of body and soul.